The blogging equivalent of nails on a chalkboard is taking the beautiful French word "voila", and completely butchering it to make the hacked-up "wah la". It is also the fastest way to get me to un-follow your blog. Hee! I've been laughing at your posts for the last half hour. I should be in bed. You should create one that says "The word is voila, not viola." hahahaha. You wouldn't BELIEVE how often I see that in writing. I totally agree with this! I just discovered your blog today and have been reading from the most recent backwards. I first encountered "walla" on Pinterest and had no idea what it was supposed to mean. Eventually, I figured it out. 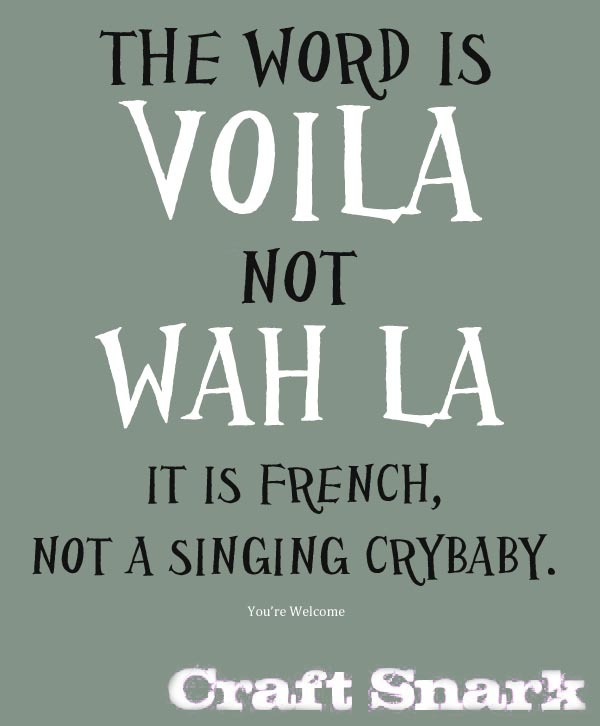 Up here in Canada (not sure where you are) we are all required to learn French in school, and "voila" is a French word, so, it is almost never mistaken for "walla." I have to admit, I was flabbergasted! I thought, "surely they are using 'walla' on purpose to be funny, like when some people say 'merci buckets' instead of 'merci beaucoup' (translates as 'thank you very much')." Unfortunately, I was wrong. Even my children, whom I homeschooled and were taught Italian instead of French, know what 'voila' means. It is such a pet peeve with me that I want to comment to those who use it that they are "ignorant" or just plain "stupid." However, that would be mean, and not in my nature. I suppose we all say something that makes us sound stupid and ignorant from time to time. LOL!